Anyone try this type of recipe? I've watched several videos of salmon all doing this same sort of technique. Brown sugar, salt brine then smoke between 150-200 degrees. Kind of between cold and hot smoking. I'm pretty boring and have only grilled salmon and have only used salt and pepper and old bay. Not sure I would like a sweet salmon but everyone seems to rave about this. It has me really wanting to try it. I have smoked numerous filets using Jamie Purviance’s recipe in Weber’s “Smoked” cookbook. It is fantastic! My family and co-workers love it. I have not tried it, I prefer just salt and pepper on salmon. 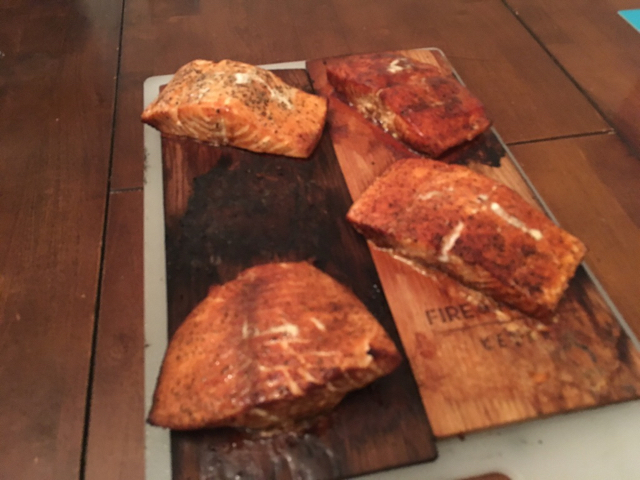 I grill salmon on cedar planks almost weekly. It's just a simple, quick, easy and healthy meal especially after work. Try it his way on one fillet so you can get familiar with the process, there are as many recipes and techniques as there are people to eat the fish, and after you've tried a few you'll know exactly what flavor profile, style, & technique you like most. One fillet won't break the bank, curl your tongue to badly, or give you the squirts for more than a couple days if something gets out of control. That recipe & technique will give you a very sweet candied flavor with a ratio of 8:1. Novelty smoked salmon that you'd buy is generally ~4:1 and traditional recipies will be 1-2:1. Keep it simple and easy so it stays fun. Don't worry about too much smoke or not enough this or that, as long as you don't over heat it while its smoking your good. The best tip I can offer is not to cook the fish. Smoking is not cooking, but more like dehydrating with smoke. It can take a long time sometimes depending on alotashit. Shoot for ~125° in the smoker. Thanks hell fire. That’s what I did tonight with the ingredients i had on hand. One hogs n heat rub, one rub and bbq sauce, one salt and pepper, one old bay, one salt pepper and my little brother’s homemade ultra spicy pepper blend. I liked the ultra spicy salmon with salt and pepper. The family said it was a tie between the salt and pepper and the bbq rub only. The rub and bbq sauce came in third and old bay last. I’m confident I do not like any sweet flavor on salmon so I will pass on the brown sugar recipes. Just my personal preference. HoosierKettle did you use red pepper flakes for spicy salmon with salt and pepper? that sound really good. No. My brother grows different varieties of hot peppers. He dehydrates hundreds of peppers every year and grinds them up to make an extremely spicy pepper powder with seeds. It was great on the salmon. The spicy piece was my favorite. @JEBIV it is great stuff if you like spicy. I can’t really compare the flavor. It’s kind of like cayenne but different. This is the first time I’ve done skinless for awhile. It was a whole filet at sams that I thought had skin. Without skin, I wasn’t real sure how to cook it. I pulled out some cedar planks that I’ve had forever and soaked them in water. I seasoned the fish than placed the planks directly over the coals. Bottom vent cracked and top open. I flipped the pieces half way through. I really liked having the seasoning on all sides. My wife liked this better than skin on so it looks like I better get used to skinless.